We’ve seen the Rouge O2 Electronic Wine Breather in the past, and here’s a more portable version of it, aptly named Pocket Rouge O2 Electronic Wine Breather. Retailing for £24.99 a pop, this device will fit into your pocket easily being roughly the same size as a chunky pen, where you can pop it into your wine glass after pouring some fine wine into it, press the button and leave it on for half a minute with a little bit of swish here and there. 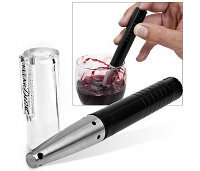 Once 30 seconds are up, remove it and your wine will be noticeably aerated and ready for drinking. Once you’re done, just rinse it off by doing the same thing in water to get it ready for the next glass. Sounds like too much work? Well, it beats having to swirl it with your hand all night long, eh? It will be powered by LR1 batteries so make sure you have some spares around if you know that you’re going to have a particularly great time that night. I never knew wine needed to breath. Maybe next time I go to a high-end restaurant, I will bring a long an oxygen tank lmfao!